As promised – a super simple scarf. 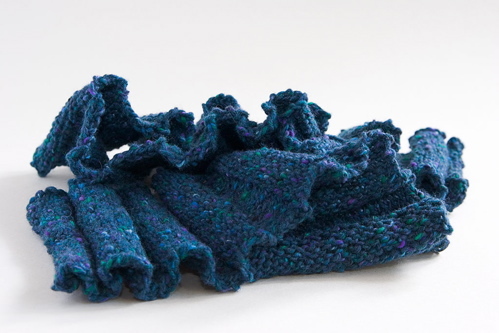 This scarf can be knitted in pretty much any yarn, but is best in Aran or DK (Worsted or Sports weight). This example is knitted in Rowan’s Scottish Aran Tweed in DK with about 35 stitches. For a thicker yarn, 25 stitches would probably be enough – it wants to be about 6″ wide, but experiment with your yarn and see what works. This scarf used 200g of yarn to make a nice, long scarf. Cast on the required number of stitches. Knit in stocking stitch for 8 rows, then knit (instead of purl) the next purl row. This reverses the stocking stitch so the front becomes the back. Continue for another 8 rows and do the same, and just keep going until your scarf is long enough or your yarn runs out. It will stretch quite a bit when you are wearing it. To get the ripple back after you wash and dry it, just lay it out and bunch up all the ripples and steam generously.